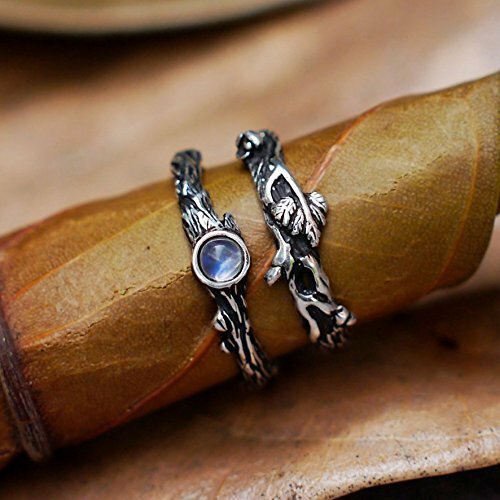 This ring set features two nature inspired sterling silver rings: moonstone ring "Dew" and thin twig ring "Mio". You can wear these stacking rings together or separately. This beautiful stack ring set is handcrafted in 925 sterling silver with natural moonstone. Perfect as engagement ring set, wedding ring, birthday or anniversary gift. There is a wide variety of natural stones available for the "Dew" ring, as listed in the "Stone Choice" menu above. This set is READY TO SHIP and will be sent within 1-5 business days from the date of purchase. If you have any questions about this product by BlackTree, contact us by completing and submitting the form below. If you are looking for a specif part number, please include it with your message.